Facebook reminded me of this picture this morning. This still gives me tingles every time I see it... I can't believe this is five years ago already. As I reflect this morning I realise how the journey of Wholeplus is such a powerful reflection of my own personal evolution. So I decided to write it down. It all began as a tiny spark of an idea off the back of a challenge from a trainer at the gym I go to. I was complaining about the junk filled protein bars that so many people eat after a gym work out intended to better their health. It makes me sad. "Oh right, you try and make something better then" he said, ..."Ok, I will", I responded and I remember feeling surprised by the sense of my inner commitment so deep I knew I would follow through. And just like that Wholeplus was born. From the naivety of my curious mind, I had absolutely no idea what lay in store. I began designing everything from scratch. The branding, the website, the promotional materials, the packaging, the social media growth, the recipes developments ... all my own creation and hours of time experimenting, learning and implementing the technicalities. It has all evolved so much since. Over the following 18 months I refined my processes and whittled it down to two products lines in a wider range of flavours - the Hotpots and the Toppers. The Hotpots (instant porridge sachets) were the last to be let go at the end of 2016 due to practicalities of production. They were popular and I still hope to bring them back one day when the time is right. I forged ahead with the Toppers. The creative sweet sprinkle topping. From 2014-16 I had loads of orders coming through. It was the time when the subscription box model was newborn and the more I was featured, the more other companies found me and wanted to feature me too. Then, I got a big Wholesale white label order which brought in a consistent income every other month. This was followed by my biggest order to date. 3000 tubs of Toppers shipped to Germany on a pallet. I had no idea what I was doing, seriously winging it and saying yes to life. In the lead up to that delivery, the entire house was taken up with boxes of product lining the hallway almost floor to ceiling. I employed my dad to help me. Then in late 2016 things slowed dramatically, the subscription box model changed and they no longer paid brands for their product but instead pitched it as a 'free marketing opportunity'. That was a massive game changer for me as there was no way it was viable anymore and it was no longer an income source. Until that point I had done no real networking or marketing off my own back- everyone had come and found me and I was just riding that wave and creating, creating, creating... I didn't know how to do it on my own! I paid hundreds of pounds for consultations with the best in the food industry. Getting advice from as many sources as I could find, trying my best to network even though I hate small talk and 'businessy' environment. I felt increasingly overwhelmed as it was all so far out of my comfort zone and relied heavily on investment. I had already spent most of my own savings paying thousands of pounds in buying the food processing equipment I needed to get up and running. In early 2017 I took some time out to reflect. What did I want from the business? How did I want it to grow? What did it mean to me? How did I want to be involved in it over the long term? I knew I was passionate about health, about personal empowerment, about inspiring creativity in others... but how could I channel this into a food product? I came up with a subscription box model of my own. 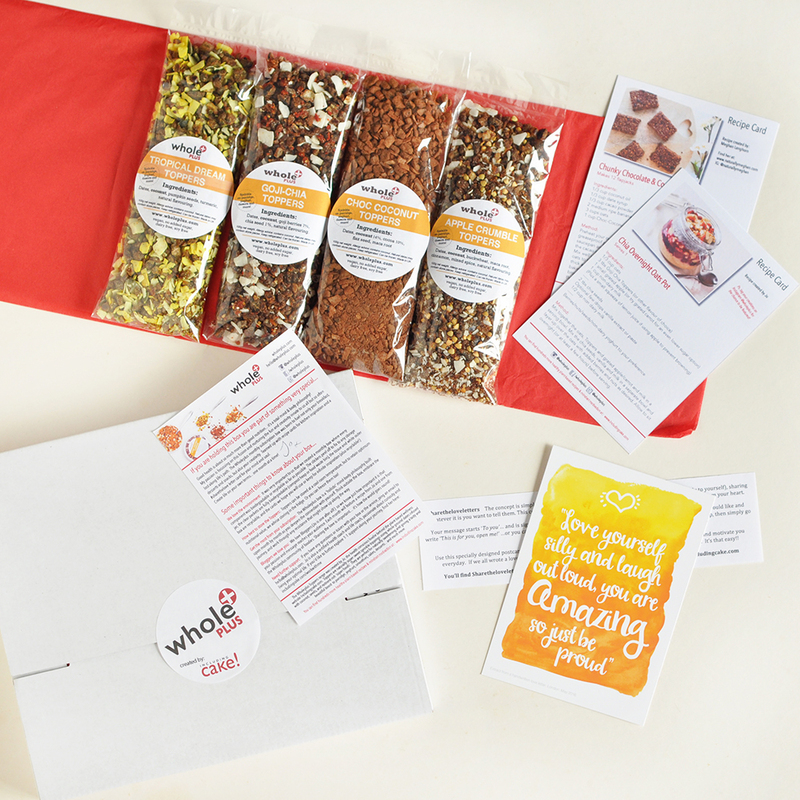 A monthly delivery box that would feature recipe cards, motivational quotes and build a sense of community over time. The concept was beautiful and I put hours into designing the product and testing the process with customers. But the promotion was hard and laborious. The physical production was now also taking its toll after years all on my own. It drained me and things slowed to a halt before it ever really got started. That realisation kicked me back into action. I had no idea how I was going to do it, but somehow I would. But I knew it woudn't be on my own. The Wholeplus philosophy is so much greater than me, it's message needs to be shared with the world, but I cannot do that alone. I needed focus on my skillsets and bring on others to fill in the gaps. In January this year I opened up a blank Word document and on it I wrote up a list of 'titles' of people I wanted on board, with me as 'Creative Director'. I kept this in the back of mind in every conversation I had, knowing when the opportunity showed up I would just know. Just yesterday I had a long meeting with the owner of a gym and food business. Someone I have come to know well, someone who complements my skill sets, someone who has the resources for production and investment already set up, and most importantly someone who shares my philosophies. He proposed moving forward as joint venture, to scale and take things as big as they deserve to be. The idea immediately energised me and I felt a rush of relief, "I'm not alone in this anymore". We have another meeting to talk details next week. On the eve of my 35th birthday, the next chapter in the Wholeplus journey is taking shape. There are so many times I almost quit. There are times when thing slowed to a bare crawl and it would have been easier to have packed it all up and filed it under a 'learning experience' and channeled my energy elsewhere. But something still tells me to keep going. Something deep down tells me this will be worth it. Something tells me this has been evolving with me in the just the way it needed to, waiting for it's moment, waiting until the world is ready, waiting until I am ready. What could you commit to create for 100 days?